While I never had the exact Joe Kennedy shoe shine worker experience, I did have a similar experience in Feb 2000 when my landscaper told me his wife was day-trading dotcom stocks. The NASDAQ market began it's steady decline 4 weeks later. Let's play a little game - What do all of these dates have in common? 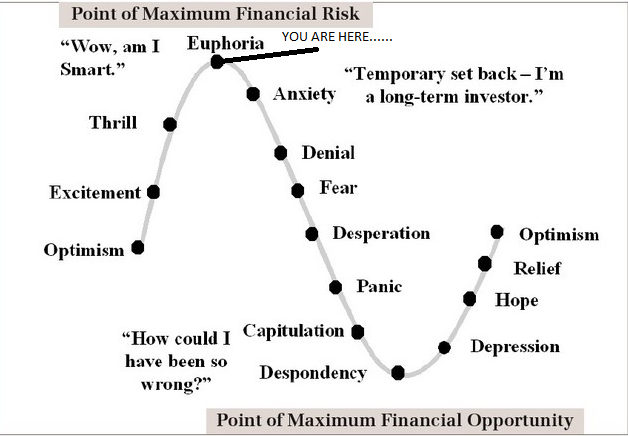 Well, they are the points at which by various measures the stock market entered EXTREME overvaluation. I've discussed 2013 before so I won't spend much time there but suffice to say the global economy began cooling in 2013 and really slid in 2014-2016 however US stocks have so substantially distanced themselves from the companies they supposedly represent that weak underlying fundamentals can be ignored in the face of what the charts show. 1) Goldman - Because Goldman again will be running the world. 2) UnitedHealthcare - Because rolling back Obamacare will mean keeping high premiums for workers, without providing coverage. YEAH!! 3) Caterpillar - Because ..... oh, I can't even pretend here - this is ridiculous, their business is imploding but the stock has soared on the hopes of MORE Federal spending in 2020. 5) JP Morgan - whatever business falls through the cracks at Goldman might go to JP Morgan. I believe that you make the most money when there are huge mistakes made that you can see coming. Well, 2017 is a HUUUGE mistake bearing down on us. You see stocks don't act in a vacuum - there are a whole host of other assets that this bubble is impacting. I expect this stock bubble to continue to chase money out of bonds. This has the impact of raising interest rates, which will further strengthen the US Dollar. That's great if you're going on vacation to Europe or Japan, but ask someone in sales how much fun it is to sell their products that are now 20% more expensive because of currency shifts and you'll hear the other side of that equation. Then the Fed will have to try to reign in bond yields by raising rates QUICKLY in 2017 and that will choke off any economic activity. Boom - The next recession will be at hand. We'll get a little preview of that today when the Fed raises rates, but don't expect any real reaction until rates start to approach 1-1.5% again. Next up.... Why cutting the corporate tax rate is a strategy from 1980 that is doomed (ok, maybe not doomed, but what are blogs for if not for hyperbole?). The markets were again crushed by a surge of buy programs at almost the exact same time as yesterday and that was the story of the day. If you bought at 11:59 and sold at 12:31 you made more than they average working man or woman makes in a week in 30 minutes. Hooray for gamblin.... I mean investing!! The subject of "fake news" is all over the media outlets tonight after Sec. Clinton addressed the topic at one of her first public appearances since the election. While I don't deny that "fake news" does exist (there is a guy dedicated to writing these fake stories who makes a very comfortable living spreading falsehoods), my greater concern is the more widespread "misrepresenting every day occurrences" as news. Allow me to explain using some weather examples - this morning one of the morning shows was in North Dakota talking about the frigid conditions where it was 6 degrees F. Two weeks ago the morning shows were in Syracuse NY covering a lake effect snow event that dumped 8-12" of snow on the area. By discussing these routine weather events --- Newsflash: it snows East of Lake Ontario in November/December and it's really, really cold in North Dakota --- as somehow newsworthy the media is creating a story out of thin air. This isn't news, it's buzzfeed-style presentations designed to keep you glued to the TV to find out if that snow in Syracuse is coming to NYC or Boston (short answer - no b/c NYC and Boston are not near Lake Ontario, but conveniently they neglect to mention this fact in their story that talked about a "winter blast invading the Northeast"). On a more local level let's consider the story that has dominated the headlines for the past 72 hours in the North Country -- another lake effect snow event. About 10 days ago you could see that it was going to be cold enough to produce snow if the winds stayed consistent when they reached Lake Ontario. I mentioned to a family member that was traveling that "there will be snow in the traditional snow belt with a strong West/Southwest wind turning West by Thursday night". It was clear that it was going to snow very hard in a very narrow band of mostly uninhabited land on the Tug Hill Plateau. 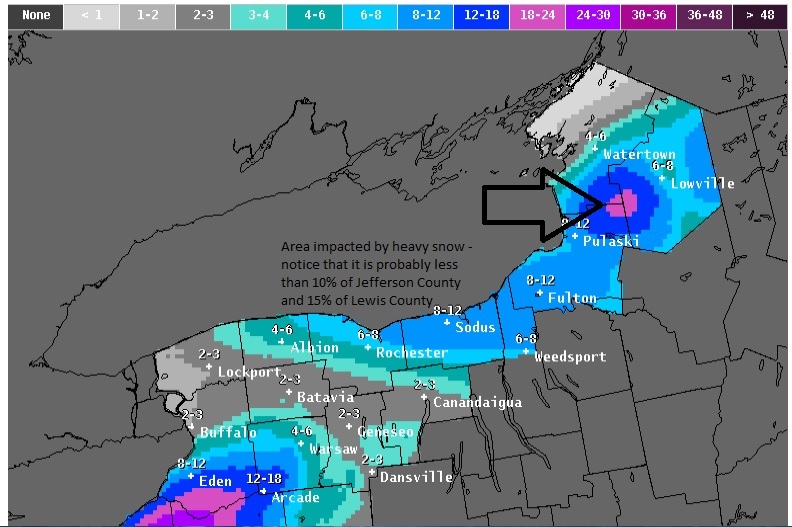 However, the National Weather Service issued a Lake Effect snow warning for Jefferson and Lewis counties (almost 2600 square miles combined) despite the fact that just a tiny fraction of those counties would be impacted. Now keep in mind where that bulls eye of the storm sits - that pink area in between Lowville and Pulaski and take note of this map. Hmm, that's interesting, I wonder why that area that is going to get pummeled with snow is awfully green on the map? Could it be because it's mostly uninhabited forests? Uh, yes that's exactly the answer. So, that's my long-winded way of say that even local sources are guilty of trying to spice up a story to make you pay attention. The reality is that this was a fairly typical lake effect event that will deliver snow to a fairly narrow section of forest land and snowmobile trails. However, that is not a story that gets you to click on it 10 times a day. If the story says LAKE EFFECT WARNING FOR JEFFERSON AND LEWIS COUNTY, you'll probably click all day for updates. This isn't an example of "fake news" but it is rather disingenuous and this is a very common practice in the entire media industry. Drive carefully if you live in Worth, NY.